Does anyone have openvm spk for dsm 6.1? 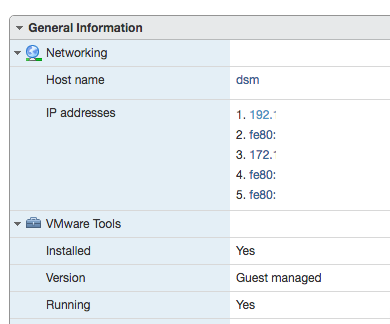 I wanted open-vm-tools / vmware tools installed on my xpenology nas running on top of ESXi, mainly so i could press the power button on the host and still have the DSM guest shutdown safely. The thought of compiling and installing a custom spk for open-vm-tools seemed to complicated and risky, so instead I created a Docker image that solves the problem. The only thing required to run this docker container is the Official Synology Docker package and for SSH to be enabled. Once the container is running shutdown/restart from ESXi will work and networking information will be returned. The ds3617 was "patched" is basicly the same as the ds3615 spk, just with changed support for the target environment. The Docker Container solution simply wrappes the shutdown hook from openvmtools and uses ssh to access XPE via shell to trigger the shutdown process there. Clever solution that is. Though, I prefer to use the spk in XPE directly. @4sag: Thank you very much! The tools are working. Could it be used on ESXI 6.0 ? Running on Microserver Gen8 with dsm6. Open-vm-tools spk poduce to much failures and spam logs..
Docker Container is working perfect! Now HDD hibernation working also. Any chance to make the SSH port configurable?